V-CC New England Section: What is veteran cycling? The Veteran-Cycle Club is an organization dedicated to serious research into the history of bikes and cycling. By extension, club runs conducted by local sections of the V-CC are intended to further members' understanding of cycling history through riding old bikes with period parts. Choice of the word "veteran" over "vintage" is intentional. Soon after the founding of the Club in 1955, the Committee ruled that "vintage is not a suitable word to use in connection with old machines unless quality is taken into consideration." Old three-speeds and mass-produced lightweights are not vintage, but they are interesting examples of cycling technology and history. Veteran embraces all old bicycles, regardless of quality. The V-CC has avoided establishing a cut-off date for machines eligible for club runs. In fact it welcomes members who do not even own a veteran bicycle, for the most important thing is to have is a genuine interest in cycling history. Club rules suggest that for machines on runs, "as a general guide, the older better." Run leaders are free to suggest themes that will bring out certain kinds of machines, or machines of a particular era, for their rides. The rules also acknowledge that history begins yesterday, hence early mountain bikes and even Raleigh Choppers have been seen on club runs. The only restrictive measure in the V-CC's rules is, "bitzas (bits of this, bits of that) have no place on club runs." Bitzas suggest what veteran cycling is not. It is not new bikes with old frames, that is, a veteran frame fitted with new or non-period parts. Sheldon Brown-style Frankenbike experiments, thirty-year-old Japanese lightweights made up to look like sixty-year-old French tourers (or fitted with a Sturmey-Archer gear as a "tribute" to pre-war British club bikes), "BOBish" bikes with hodgepodge parts from various eras thrown onto steel frames - any of these can be a nice bike to ride, useful and interesting to it's rider and his riding or Internet pals, but they are not veteran cycles. Better to come out on a new bike, because in the context of a ride affiliated with a cycling history organization, the new bike at least is an exemplar of its era. However, "keeper of the flame" has no currency in the V-CC. New bikes made in the style of veteran cycles may be regarded as "classic, " or classily inspired, but they are not veteran cycles. "As a general guide, the older, the better." None of this should be taken to mean that V-CC members are so dogmatic about period correctness as to complain, in the words of the late John Pinkerton, "because somebody has the wrong pattern tread on his tires." Period correct certainly is the aim, and we admire the effort that goes into securing such difficult to source parts as period rims and saddles, but we all know that not all veteran bikes come together at once. Nobody turns up a nose at modern brake cable housing, new but classically proportioned box section rims, or 700C tires on bikes that were built for 27s. If a safe, reliable period handlebar has not been found yet, there are Maes bends currently made in widths that suit period lightweights. These are examples of sympathetic parts, as are later production examples of period parts, e.g. '70s Weinmann 500 brakes standing in on a 1950s bike that may have used the same model brake, albeit with an earlier style of maker's stampings. While there can be no doubt that most veteran cyclists would be pained to see a plastic saddle on a pre-1970 bike brought to a club run, we are always pleased to see a Brooks B.17 on any veteran cycle, regardless of whether the saddle was made in 1899, 1949, or nine weeks ago. If your saddle matches the year or decade of your machine, that is a nice touch, but we all know how scarce useful survivors are. Nonetheless many period parts are easy to source given the patience and diligence that make veteran cycle projects worthwhile. One who resorts to use a Velo-Orange crank with the old BSA five-bolt pattern on a veteran frame, instead of TA Pro, Stronglight 49D, or a cottered crank, as suits the period, simply is not trying hard enough. Cranks, brakes, pedals, and hubs for post-war machines are numerous on the ground. Period gears, outside certain Campagnolo and Sturmey-Archer items, are scarcer, and often dear. This may contribute to the phenomenon I have observed in the club magazine, where Shimano rear changers are appearing on bikes that otherwise are outfitted in period correct parts. (Of course, this also may reflect the fact that the V-CC is very much an organization dominated by riders over fifty; gears on old machines are few, and there is only so much easy terrain to go around). It is fortunate, however, that the price of entry into veteran cycling remains very low. One needs nothing more than an old Raleigh three-speed. In the V-CC, period roadsters have a following as enthusiastic as that for post-war lightweights or for the often magnificent machines of the solid-tire safety era. It has been observed many times that the act of dissembling a machine that was used and transformed by one owner over a long period, and fitting it with period components from the date of the frame's manufacture, constitutes destroying the bike's history. A strong case can be made for this viewpoint. 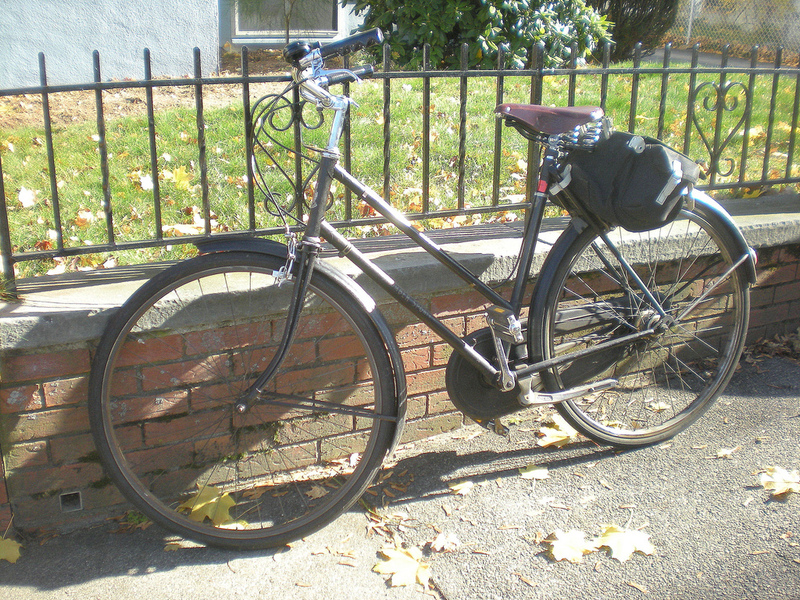 A well-used bike with deep patina of age and use usually came to be that way because it was the one machine of a longtime touring and commuting cyclist who made changes to it over the years. It is worthwhile to preserve the evidence of slow evolution, even down to that Shimano derailleur that went on thirty years or more after the bike left its maker's workshop. Touring journalist and veteran cyclist Dr. John Dunn wrote more than a decade ago, about a hypothetical Baines Flying Gate of the late '30s, that authenticity rests more truly with the artifact as found after sixty years, not with the artifact as "taken back" to an imagined specification at its origin. He argued for preserving the history of the bike, illustrating one owners' response to the evolution of bicycle technology and to his own changing needs. To preserve such an evolved bike is an act of historical consciousness. However this is not license for us to take a bare period frame, fit non-period parts, and call it a veteran cycle. The hypothetical Baines, as it evolved, would be evidence of history. We are not allowed to simulate the process; that would be not history but pastiche - a bitza. It must be said, finally, that the considerable satisfaction of riding a period correct machine is always worth the time, effort, and expense that goes into the project. Restoring a veteran cycle teaches and reinforces mechanical skills vital to anyone worthy of the name compleat cyclist. Use of period gears, brakes, and related parts conveys an understanding of cycling history that cannot be gained from a book or chat room. Club runs provide opportunities to enjoy veteran machines with friends who appreciate them, and who seek to learn from each others' projects and investigations in cycle history. In turn, saddle time on veteran machines enlightens those pleasant hours of armchair cycling with Patterson, Wayfarer, Stancer, Kuklos, et al.